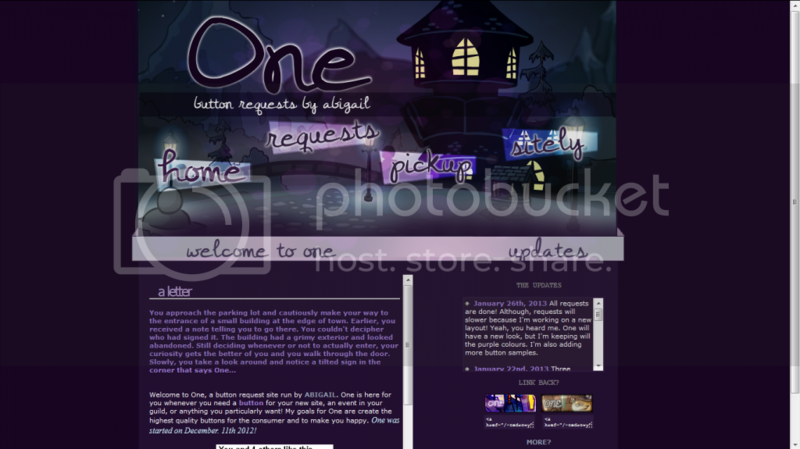 Welcome to One, a button request site run by Abigail. One is here for your every button need! 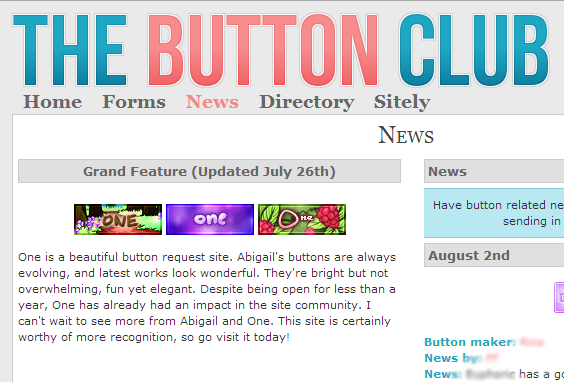 Since December 25th 2012, One has been providing stunning buttons for you and your site. My goals for One are to create the highest quality buttons and to make you happy. Two new link backs yaaas! I'm such a bad person I'm sorry for not updating, gosh. CLICK TO VIEW MY PORTFOLIO! Ahh, welcome! An old man says after you enter, Nice to meet you deary, I'm Cedrowy! You must've gotten my letter. I sent them out to a lot of people, but you are the only one to respond. He chuckles. You can go look in the Box if you'd like to take something. Please only request when request's sign says they are open! If you actually have read the rules, copy and paste the cat's meow in your form. I will complete requests for under-construction sites, as long as you have a layout up. I will not complete a request for another button request site because I feel as if you should make your own buttons. I will most likely not respond if your request has been accepted. I will however most definitely notify you if I have a question, your request has been rejected, or that it's ready for pickup. If you haven't received a response or weren't put on the waiting list within 48 hours, feel free to resend your request. I do take requests from offsite places, but contact me on my dA, @backtalking. While this is not a 'rule', I'd greatly appreciate if you used my buttons. If you do not like it, neomail me and I can remake your button or put the base to better use. Completely Yours buttons are currently open. These buttons are for those who know exactly what they want from the Box. Click here, for more info! Box's Pick buttons are currently open. These buttons are for those who don't really know what they came for and want the Box to choose for them. Click here, for more info! Nebula buttons are currently open. These buttons are for those who want quick and fast buttons. These buttons already have a pre-picked animation, font, and have a nebula as a background. Click here, for more info! Gift button requests are currently open. These buttons are for those who are feeling generous and request a button for a site in need. These requests are Box's Pick. Click here, for more info! Completely Yours buttons are for those who know exactly what they want and just need it to come to life! Bellow you can find border choices, animation choices, and places to pick images. Borders add a the finishing touch, the closing to a button. Below are some options you can choose from! Some of these borders are the amazing works of others! The fade border can be applied on any other border, ex. Curved Corner border with fade inlay. Animations add a nice feel to a button, though it is optional, it is highly recommended to have! Fill up and down, Parade, Layer, One by One, and Colour Change aren't compatible with large fonts. Here are a few places you can check out! Box's Pick is when the Box chooses out each and everything for your button based on the text and theme of your site. These buttons tend to turn out better because they aren't forced together, and the Box has more room to imagine. Above are a few examples. Nebula Button are simple buttons with a nebula/texture background. They have a pre-picked out font and animation. These buttons are completed very quickly and are recommended if you want a button fast. Above are a few examples. Gift Buttons are for those who are feeling kind and wish to give away a button, but are not able to make their own. These buttons are special, and by no means possible do they have to be used. Neomail me when you have picked up your button, button codes are removed after five days. Cedrowy runs up to you as you were walking out of the parking lot, Wait! He puts his hands on his knees and takes a few breaths, I'm not as fit as I used to be. Anyways, the Box just opened up a new little area for the best customers. Why don't you check it out? In need of a layout? From time to time, the Box decides to grant a few people full page petpage layouts! Click here to read more. Have specific questions and want a quick response? Ask the button maker! Click here to read more. 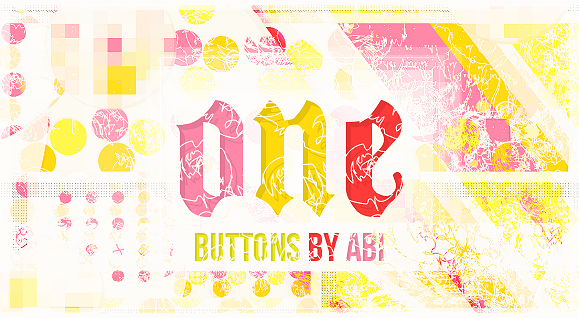 Here you can find premade buttons, placeholders, and textures! Click here to read more. This is where the best buttons recieve a little love from the Box! Click here to read more. One's retired link-back buttons and layouts! Click here to read more. All you need to know about about the button maker herself! Click here to read more. All of One's accomplishments and scores. Click here to read more. Everyone's been wondering how to do the Spread animation that I've used in a few of my buttons! Here's a tutorial so you can learn how! Click here to read more. Please use the layout, it hurts my feelings if you don't or just put it up for a week. If you don't like the layout, just tell me! In the case you don't like the layout, I can edit the graphic , but I will not completely remake it. Q/A's ARE OPEN. One's Q/A box is a way to find out a quick answer for a problem you are having with a layout, an opinion on a graphic, a tip/trick, etc. This will go over neomail, you neomailing me the first question, me responding with the answer. You can ask as many questions as you need! If you need further explanation, don't be afraid to ask! Here, you can find button resources to make your own buttons! Cedrowy says. We have a wide variety of things to choose from, just be sure to credit back to One, if used. I really love the simplicity of this button. The base is perfectly edited and has a nice, warm, welcoming feel. I *love* the text. I'm still in shock of how you make pixel text look this good! I'm not very good at it myself, tehe. Overall, this is a high-quality beautiful button. I can't wait to see more, Emma! Congrats! You've been selected for the Button of the Week Award! Feel free to adorn this button on your site! Hello! I'm Abigail, owner of this fine establishment. My main account is kingwise and I don't own any sides yet. I live now just moved to Georgia United States and I'm used to moving around alot. I'm currently in high school and my least favourite subject is Human Geography. Feel free to drop me a neomail if you'd like to know more. On neopets, my main focus is One and getting my avatar count up (that'll happen). I love to draw neopets and other items and playing around in Photoshop since I just got it. Gimp is my life. Photoshop cs6 is fabulous! These are all the accomplishments One has received. Thank you so much for everyone that let us get this far! This tutorial works in Photoshop CS5 and any other version that has the tween and motion blur options. 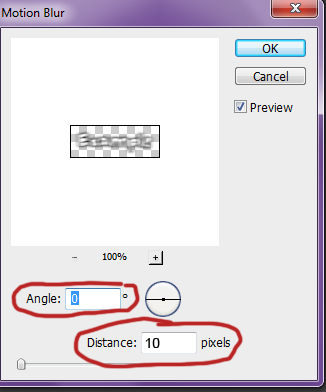 This tutorial has not been tested in gimp! In order to start animating, have your base ready! Set up your layers so the text is separate from the base like above. Duplicate the text layer and make the duplicate invisible like above. Motion blur the the visible text layer with the settings above or feel free to experiment. Open up the animation window or timeline ( Photoshop CS6). Set it up so the first frame has the clear text, the second frame has the blurred text, and the third frame has the clear text. If done correctly, it'll look like above. 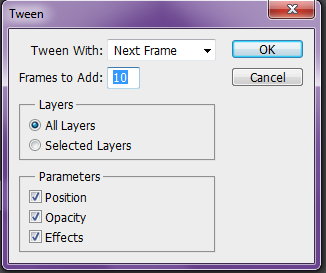 With the first frame selected, tween with the settings above. Then, select the second to last frame and tween again. Add 10 to 15 blank frames and you're all done! Now that yous gotten what you want, Finan says. Yous can tell people about One by using these here buttons or you can visit other people's shops. Fiasco is an awesome button request site by Kiwi! Kiwi makes absolutely stunning buttons, and amazing content! Her colouration of the buttons is stellar, the animations are beautiful, and everything complements itself. 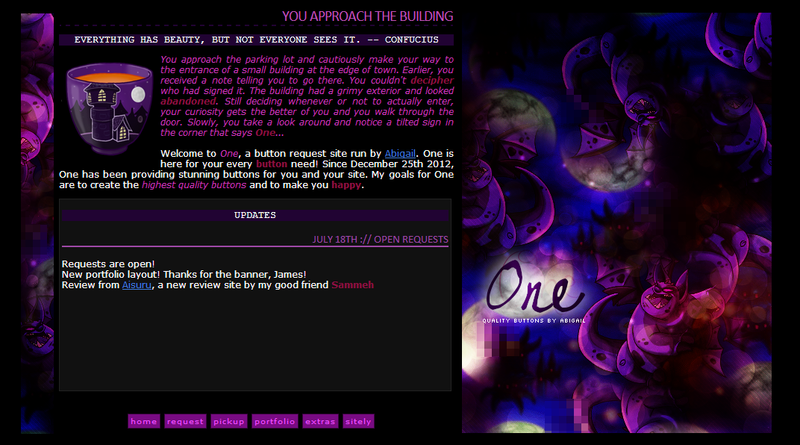 Please visit Fiasco, I would definitely recommend checking her out and maybe requesting a few buttons! Aether is a brand new button request site by my good friend, James (BBY)! James is truly masterful in the ways he makes buttons! They are gorgeous in every way possible and always end up clean. He's super nice and finishes requests really quick. :* I highly recommend Aether! AFFILIATES ARE OPEN Apply by neomailing me with the name of your site, the link, and any other important info. If you list/want to list One, please neomail me! Details & Extras - for help with shine animation, png renders, textures, and bullets.